They say it's not what you know, it's who you know, and that mantra can certainly be applied to football. Even the most talented player in the world needs guidance to ensure their potential does not go to waste. The best managers of the modern game are not just those who know their tactics, but those who form bonds with their players and help them achieve the greatness for which they are destined. Here are six mentors who tutored some of the best players in the world today. 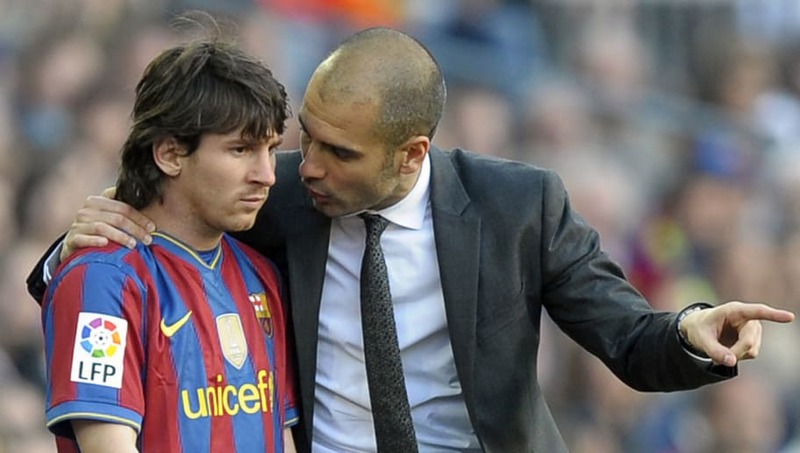 Pep Guardiola himself was tutored by one of the greats of the game, Johan Cruyff, so it was a case of the apprentice becoming the master when he took his first managerial job at ​Barcelona in 2008. By that time, ​Lionel Messi was already a Barcelona regular and well on his way to greatness, but Guardiola accelerated the process. Under the Catalan's tutelage, Messi became a better rounded player and won his first Ballon d'Or the year after Guardiola was appointed. Experimenting with Messi in the newly-created 'false nine' role worked wonders for the Argentine's development, turning him into the goalscorer supreme we know today, and Messi has stated on several occasions his desire to work with Guardiola again. Harry Redknapp saw the potential in him, Andre Villas-Boas handed him his Premier League debut for Spurs and Tim Sherwood gave him a run in the team, but it wasn't until Mauricio Pochettino arrived at ​Tottenham that ​Harry Kane realised his full potential and became a world class striker. Kane was almost immediately a first team regular under Pochettino, scoring 21 goals in 34 Premier League appearances during their first season together. Kane attributed his fitness and goalscoring prowess to Pochettino's training methods as the Argentine stamped his influence on the squad. Pochettino has lauded Kane as one of the best strikers in the world, and he's been proven right as the England striker has already scored over 150 goals for Spurs. Both men's loyalty to Tottenham will be tested in the near future, but the opportunity to keep working alongside each other may convince them to stay put. ​Cristiano Ronaldo arrived at ​Manchester United in 2003 as an incredibly talented but often petulant and headstrong player who needed someone to take him under their wing and point him in the right direction. He could not have had a better mentor than Sir Alex Ferguson, who saw what Ronaldo could become. He allowed his natural talent to blossom and encouraged him to channel his frustrations into his performances rather than at opposition players or the referee. Ronaldo joined Real Madrid in 2009 and has gone on to win countless team and individual honours, but he never forgot the man who made him what he was, and Ferguson greeted Ronaldo like a proud father after Portugal won Euro 2016. When Jurgen Klopp plucked Robert Lewandowski from Lech Poznan in 2010, few could have envisaged that the Pole would become one of the world's best strikers, particularly when he only scored eight Bundesliga goals in his first season at ​Borussia Dortmund. Klopp's faith in Lewandowski never wavered and he was handsomely rewarded when Dortmund went on to win the double the following season, with Lewandowski scoring 30 goals. He went on to score over 100 times for Dortmund before joining Bayern Munich in 2014. The two men will be reunited in the last 16 of this season's Champions League, and Lewandowski is looking forward to it. "He was a coach who also had a very big influence on my career and I can only be thankful to him," he said. Even though he would probably score more goals and win more trophies at a club like Barcelona, Antoine Griezmann opted to stay at ​Atletico Madrid last summer, and continuing to play under Diego Simeone was one of his main reasons for doing so. When Griezmann first arrived at Atletico in 2014, he struggled to cope with Simeone's intensity and was often the first player substituted. But the Argentine's tough love ultimately worked wonders, and by the end of the season he was full of praise for his now firing forward. Under Simeone's continued guidance, Griezmann has become one of the best players in the world. He won the first major trophies of his career last year - the Europa League with Atletico and the World Cup with France - and as an older player in a young France team, he is quickly becoming a mentor himself. Although ​Gareth Bale's talent was always apparent, it didn't do much for Tottenham at first. Upon his arrival from Southampton in 2007, Spurs went 24 league matches without victory with Bale in the side, and he lacked the defensive acumen to complement his attacking flair. Harry Redknapp identified Bale's strengths and transformed him from a left back into a winger, which became his permanent position after that career-making performance against Inter at San Siro in 2010. Redknapp was not as visionary as he makes out in his autobiography - he thought Bale would eventually revert to left back and nearly sold him to Birmingham for £3m - but he still deserves credit for nurturing a talented teenager into a world superstar.